University Hospital Waterford as it now stands is light years away from the scattered collection of single storey units which reflected its earlier designation as a treatment centre for tuberculosis. This regional centre of medical excellence has embraced the integration of the arts into healthcare with enthusiasm since the early 1990s. Dr Abdul Bulbulia first suggested the idea of introducing the arts into the daily life of University Hospital Waterford in 1990. At this time, the potential role of the arts in the hospital environment was a new concept in Ireland. It had, however, been explored in the UK for some 15 years previously. Once the hospital management saw the value of the proposal, a committee comprising representatives of the hospital, arts and business sectors was set up to oversee developments. The success of Waterford Healing Arts Trust is largely attributable to the dedication and commitment of this committee. Dr Bulbulia, Mai Lannigan, Mary Halpin, Tony McNamara, Derek Verso, Willy Fanning, Peter Finnegan, Peter Jordan and Mary Baxter developed WHAT in the early years. From its inception, strong support has come from the South Eastern Health Board/HSE, Waterford City and County Council, FAS/Department of Social Protection, the Arts Council and corporate partners. In January 1994, Aifric Gray was appointed to the post of Artist in Residence for a six-month pilot project. She went on to become the full-time Arts Co-ordinator, a role taken up in 2002 by Mary Grehan. Leah Coyne also worked as Arts Co-ordinator from 2004 to 2006. Claire Meaney became the Assistant Arts Director in 2007. WHAT now employs a team of eight staff, including five on a Community Employment scheme, and a team of artists working on a session and/or commissioned basis. 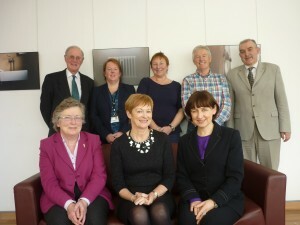 In 2008, WHAT developed Ireland’s first dedicated Centre for Arts and Health in the grounds of University Hospital Waterford. In 2011, WHAT developed artsandhealth.ie with Create and funding from the Arts Council as a resource for the arts and health sector in Ireland. In 2012, WHAT adopted a new Constitution which provided for the creation of a membership base. From 2013, people were invited to become members of the organisation and were given the powers to elect another member or to be elected on to the WHAT committee. To become a member, please download the membership form here. For information on the current Directors of WHAT, click here. Click the links below to read about WHAT’s previous work.